Glenmary’s Vocation Office has published a new magazine specifically for men discerning a vocation as a missionary priest or brother. 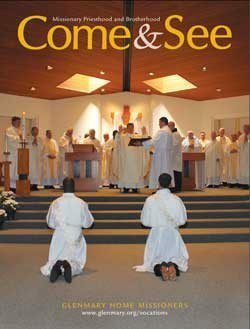 Our Come & See magazine answers the pertinent questions that discerners have about community life, the ministries of priests and brothers, the formation process and much more. If you are at any stage of the discernment process, this magazine will help you to learn more about Glenmary and the ministry we undertake serving the poor and forgotten in the U.S. missions. Please contact us if you would like to receive a copy or would like copies to distribute at your parish or school.